Are you planning on investing in Bangalore city? Have you been looking around for more insight into Bangalore real estate and property rates? Is the History of Bangalore Real estate a concern to you? Then this article will not only help you know more about Bangalore (Bengaluru) and its professionalism for years, But also guide you in terms of Bangalore Real Estate and Bangalore property rates. Bengaluru the capital of Karnataka is proving to be a shining spot for real estate investors. The city has witnessed phenomenal migration for several decades to become the hub of Indian IT industry with a 40 per cent share. Bangalore has never failed to lure settlers, investors and property buyers with its charm. It scored more on the growth index than any other south indian cities, while it remains the preferred choice of the most quality conscious realty clients. 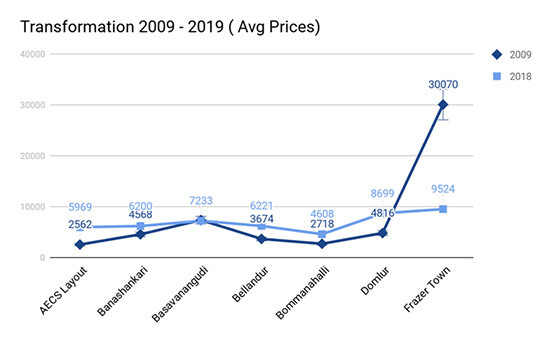 Even though Bangalore saw some unrealistic rise in the property prices until 2007, the property prices in the city witnessed a sharp drop in the year 2007. In some areas like Sirajpur, where the concentration of IT firms is more, prices had come down by 20% while in posh localities for example Jayanagar and JP nagar, there had been a 15% fall. Such a drop seemed very strange especially when prices in Mumbai and New Delhi and indeed many other similar grounded cities were witnessing a phenomenal increase. So what has led to a dent in property prices in the IT capital of India? Experts believe that, the properties in Bangalore always had fake or rather inflated property rates. It had to soar because of the hype that persisted around the IT boom in the city. Some experts justify the sudden fall by saying that the property prices in Bangalore were unrealistically high until then. That led to a demand and supply mismatch as a result of which at least 5,000 apartments were lying vacant. Dealers, who used to sell at least around 60 flats in a quarter, could sell only about six. Concluding the IT matter : The advent IT industry to the city led to a huge rise in realty prices. Sky high prices started getting quoted just because It personnel could afford it. Result : non-IT people too had to swallow these higher rates. Inflated prices in turn generated a false realty market in the city, wherein people not even remotely connected with the construction industry started building apartments. Thus, a city, which had just 40 apartment buildings till 2007-8, had over a 1,000 in 2015. And a majority of them are still lying vacant. However If you compare the number of vacant properties, unsold houses etc in Bangalore with other cities like Mumbai and Delhi, it is still playing it safe. Why is Bangalore an exception? Here are some reasons. Secondly, the Bangalore market is a best example of a joint venture market. This means that the developer doesn't invest much in developing a property here as the land cost is relatively cheap, and since the land-owner becomes the joint partner, the burden on the builder would be considerably lower. 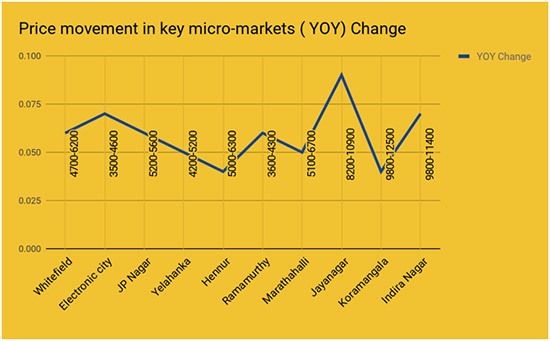 The sudden surge in Bangalore properties only occurred in the last quarter of financial year 2011-12 due to launches in the middle-income segment by large realty companies such as the Prestige Estates Projects. Bangalore is a market for end-users, which means that due to stable business scenario in Bangalore and de-growing business scenario in Mumbai, investor confidence is more towards Bangalore-based companies. This is why capital values for residential properties in the city are expected to either remain stable or record marginal growth. In 2009 more than 5 cities were ahead of Bengaluru (India’s technology heartland) on the list of the country’s top real estate markets. However in 2015 the plates had turned and Banglore was on one of the top list. In Fact it was on the peak, the southern Indian city was then the country’s leading real estate destination, beating Mumbai, Pune, Thane, Noida and Chennai, which were ahead of it in 2009. Bengaluru, owes its top rank to the Professionalism shown by the the people of bangalore, according to the reports. On the supply side, developers in the city launched smaller projects, are well capitalised and aren't entirely dependant on cash flow from sales to fund projects. On the demand side, buyers never lose confidence because they always pay for completed projects unlike in other cities. Bangalore, with all due respect to its status as the ‘Silicon Valley’ and ‘Garden City’, faces real challenges in terms of addressing and delivery of basic infrastructure and services to all its stakeholders. Bangalore is currently experiencing a strange yet positive transformation. Bangalore is currently standing out as a beacon of globalising world and to sustain this, it needs to systematically address and work on the key challenges faced by the city in terms of governance and infrastructure. Disclaimer : The views expressed above are for informational purposes only. We do not guarantee the accuracy and completeness of the information and shall not be held responsible for any action taken based on the published information.